In this issue: Science, art, and tornadoes come together for small problems, BIG TROUBLE. New Wisconsin Women Making History website shares their stories, our legacy. Poet and Academy Fellow Robin Chapman goes in search of poems in wild places. New Wisconsin Poet Laureate Kimberly Blaeser shares some personal history and insight into the transformative power of poetry. A tour of the "Sparta Zoo" and the Waterways exhibition at the James Watrous Gallery. Fiction from a first-time author and poetry from a couple of grizzled veteran poets as well as book reviews of new Wisconsin titles, harangues on the Wisconsin Idea and the state of Wisconsin fiction from editor Jason A. Smith, and more. As a result of the legislative “drafting error” that lead to the deletion of the Wisconsin Idea from the budget, millions of people now know about it. Or do they? Years ago, a student asked me at orientation what qualities he would need to be successful in my Freshman English class. I came up with three. Wisconsin Women Making History shares the stories and accomplishments of Wisconsin women who, for various reasons, are less known or acknowledged than they should be. A new program at the UW Hospital is helping performers find medical care tailored for their special requirements—and talents. 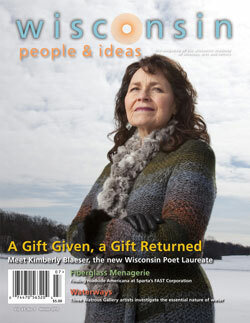 Wisconsin Poet Laureate Kimberly Blaeser's connection with Wisconsin is rooted in a spiritual engagement with place. The seagull glides over me, surprisingly clear and large, onyx eyes looking down, black-tipped wings outstretched, its fractured shivering shape a reflection in the water—except that I’m looking at it from the other side. With humor and admiration, John Hildebrand focuses on the “solid, physical detail around which the intangible clings” to conjure a sense of the Midwest. In his sixth novel, Jerry Apps explores the contentious issue of frac sand mining.